The Beginning – Praktica PB SLR System. Praktica BC1, with (left to right) Pentacon 28/2.8, 50/1.8 and 135/2.8. I started my photography journey in 1986 when I bought my very first SLR – the Praktica BC1. I bought it new from a 2nd hand shop. Even at that age, where I was a second year student in the University, I had already made up my mind that I wanted a Germany system. I jumped into the Praktica system without doing much homework, thinking they were made in Germany anyway, only to find out later that they were actually from East Germany. But things probably would not change much because at that point of time as a poor student, that was probably the system that I could afford. So it was a BC1 with a 50/1.8 Pentacon, and very soon a 28/2.8 Pentacon and a 135/2.8 Pentacon were added to the system. The build quality and mechanical refinement of the Praktica system was not comparable to the West German ones, or the Japanese systems. However the fine Prakticar optics did produce very respectable results and definitely very good price to performance ratio. I used the system for many years before I ventured into the West Germany origin Rolleiflex SLR system. It was sad that with the unification of Germany, the Praktica system died out. The brand is still being used today but it is no more the very good value for money SLR system but are things like point-and-shoot film and digital, bino and etc. 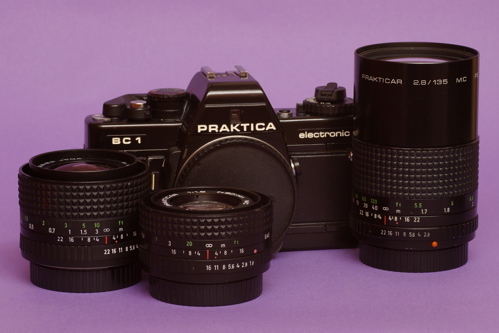 Prakica PB system was quite complete with lenses from Carl Zeiss Jena and Pentacon from 20/2.8 to 300/4. There were a 500/5.6 and 1000/5.6 from the Pentacon medium format system that could be used with the PB bodies via adaptors and had no open aperture metering. There were also winders and close up photography accessories. The Carl Zeiss Jena series of lenses were 20/2.8, 35/2.4, 50/1.4, 55/2.8 macro, 80/1.8, 135/3.5 and 300/4. These were multi-coated Jena lenses of very high image quality. The Pentacon series of lenses were 28/2.8, 50/1.8, 50/2.4 and 135/2.8. The 28/2.8 seemed to be not as good when used at widest aperture, but it could perform if stopped down adequately to f5.6 and beyond.